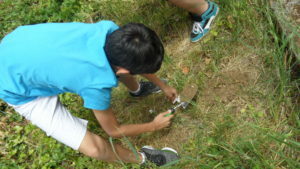 The Institute of Landscape Ecology of SAS engages Slovak students and scouts in the decomposition experiment of the global study called Teatime4science. 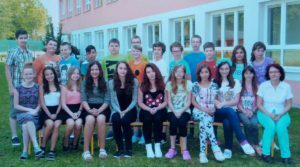 The students from cpt. Nálepka elementary school (https://trojka.edupage.org/) in the Nové Mesto nad Váhom city and the scouts from the 41st T. Masaryk corps in Topolčianky participated at the global decomposition study Teatime4science. 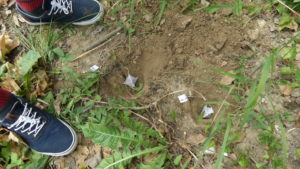 The decomposition is measured with use of nylon mesh bags containing plant material. The mesh bags are weighed, buried in the soil, and after a certain time they are digged out and weighted again. The loss of weight represents amount of material that has been decomposed (download instructions: http://www.teatime4science.org/wp-content/uploads/Czech.pdf). This simple and inexpensive method for measuring the decomposition rate was developed by Judith Sarneel of Umeå University in Sweden, in collaboration with scientists from the Netherlands, Austria and Vetenskap & Allmänhet in Sweden. The scientific relevancy of this new method has been already confirmed and experiments are currently taking place in different countries around the world. 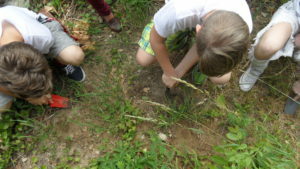 The students and scouts buried Lipton Rooibos and Green tea bags in June 2017. They digged out the tea bags in September 2017, and weighted them. The data were uploaded to the project web page (www.teatime4science.org), which also provides all the information about the experiment. Contact person for ILE SAS: Mgr. Veronika Piscová, PhD.